This is part of a series of posts on fundamental Catholic teaching on Scripture. In this post, we delve into some of the specifics of the human dimension of Scripture: in this case, the original language(s) of the Old Testament. The original language of large majority of the Old Testament books is Hebrew. Hebrew is the ancestral language of the people of Israel. It is a Semitic language, that is, one of a family of Near Eastern languages that share certain features such as tri-literal word roots (most words are formed from a root consisting of three consonants), the absence of true verbal tenses, and a paratactic syntax. In ancient times, Hebrew was (and continues to be) written from right to left without vowels, using a form of script now called paleo-Hebrew, an example of which is illustrated here, from a ninth-century BC inscription found in northern Israel. A radical linguistic and literary shift occurred for the people of Israel when much of the population of Judah was deported to Babylon in 597 and 587 BC. During the decades the Judeans spent in Babylon, they began to speak Aramaic, the international language of the day. 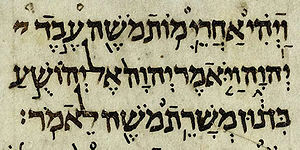 Aramaic is the mother tongue of ancient Aram (modern Syria), and it is closely related to Hebrew. The two languages are almost mutually intelligible. Not only did the Jews begin to use Aramaic as their spoken language, they also adopted the Aramaic square script, which continues to be the font used for copying and printing the Hebrew Scriptures to this day. Since ancient Hebrew was written without vowels, it was not possible to interpret the ancient texts of Scripture properly without learning the oral tradition of the community from those responsible for the preservation of the documents—usually the priests and scribes. There is some theological significance in this fact, inasmuch as it demonstrates the reciprocal, complementary relationship that has always existed between sacred Scripture and sacred tradition. The Hebrew language did change during the centuries that the books of the Bible were being composed, so not all biblical books are written in the same kind of Hebrew. 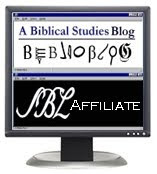 The distinction between Classical or Standard Biblical Hebrew (CBH or SBH) and Late Biblical Hebrew (LBH) is widely recognized by scholars. Classical Biblical Hebrew is a pre-exilic form of the language; Late Biblical Hebrew reflects the influence of Aramaic and other linguistic changes introduced during the trauma of the exile. A good contrast between the two forms of the language can be seen between the Classical Biblical Hebrew of the historical books Genesis–Kings (the “primary history”) and the Late Biblical Hebrew of the Books of Chronicles, which employs the earlier books as a source. Since, however, it may have been possible for ancient scribes to write documents in an older form of the Hebrew language (a procedure called “archaizing”), and conversely, it was possible systematically to rewrite an older document in a more contemporary form of the language, the use of linguistic data to assign the composition date of biblical documents is hotly contested among biblical scholars. Besides Hebrew, two other languages are employed in the Old Testament: Aramaic and Greek. All of Tobit and portions of Daniel and Ezra were originally written in Aramaic. The Wisdom of Solomon and 2 Maccabees were originally written in Greek. All other books of the Old Testament, including 1 Maccabees, were first written in Hebrew. it was written without vowels, not without consonants. it's Semitic, not Hawaiian. Thanks for catching that, Scott! I guess it's my Hawaiian roots showing themselves (Kalaheo H.S. class of '89)!